Cadaver dogs are canines, Canis familiaris, which are specially trained to find human decomposition scent and alert their handlers to its location. They are used in a variety of forensic contexts, including search and discovery of human cadavers, body parts, or body fluids. In contrast to bloodhounds or other tracking dogs—which locate a specific scent on the ground or an item—cadaver dogs are trained to detect generic scent in the air. In particular, these dogs are conditioned to give an alert to the scent of human decomposition. They are sensitive to the odor given off by newly dead bodies, which may lack any obvious signs of decomposition. They will also alert to decomposing bodies, to skeletal remains, or even to soil contaminated with human decomposition fluids. Because of the sensitivity of air scent dog olfaction, even buried bodies or bodies dead for 20 or more years can be detected in certain circumstances! The first dog trained exclusively for cadaver search by a police department began work in 1974. The NY State Police were investigating a homicide in Oneida County that involved multiple buried victims in a large forested area. Increasingly, the cadaver dog/handler unit is part of a multi-disciplinary search team including medical examiner, anthropologist, and law enforcement members, among others. If the dog is chosen solely for air scent work, the principle drive is the prey drive. Bas ically, you should look for a dog that is “ball crazy.” The dog should follow the movement of the ball. . . . A dog that is adaptive to new sites, one that is not startled by loud noises and recovers easily, are good traits. All animals directly sense chemical molecules. This is true even in animals that lack a nose. Bacteria are known to sense and cluster about certain chemicals. Flies sense molecules through their feet. Human beings have approximately five million olfactory receptor cells. A bloodhound has 100 million such cells. Scent is produced when molecules from an object are dispersed into the air and register a sensory reaction in the brain. Molecules shed by the object become more and more dispersed the farther away from it they move. This concentration gradient theoretically forms a scent cone. Mammals are able to detect both the presence and the relative concentration of scent. Interruptions to, and enhancement of, the spread of molecules from the source may distort the scent cone. The decompo sition process commences immediately after biological death occurs and proceeds through five stages before the body is completely skeletonized. Certain elements are necessary for the process to occur. These elements affect how rapidly the remains proceed through the stages. The decay process produces a variety of gases, liquids, and acids. It is these by-products that provide the odor that the dog is trained to recognize and indicate. There are two special situations with different scent results: If a body decomposes in a wet environment, the adipocere, a grayish, soapy substance provides a good scent picture to the dog. If the body is left in a hot, dry environment it will mummify, and the odor will be musty, also recognizable by the animal. FRESH: Little or no exterior change; however, is decomposing internally due to bacteria present in the body before death. Odor: None detectable by humans; however, animal may show reaction or approach body as if it were still alive. Dog may detect at some distance. BLOATED: Body swollen by gas produce internally. Insect activity may be apparent. Odor: Decay odor present. Detectable by bot dog and human. Can be detected at a distance. DECAY: Body collapses as gas escapes. Exposed flesh may be thick. Odor: Strong putrefaction odor detectable by dog and human at some distance. LIQUEFACTION: Liquids created during the decomposition process seep into the environment. Body drying out. Odor: Reduced odor production. May smell cheesy or musty. Animal may still detect at a distance. DRY/SKELETAL: Slow rate of decay. Remaining flesh may be mummified. Odor: Musty odor. Detection distance shortened. *Detection distance varies with wind direction, weather and terrain. If approaching upwind, detection distance will be much greater than if working with wind at the handler’s back. Microorganisms: Normally present in the lungs and intestinal tract. Many are necessary in a living person for normal functions. If death is the result of disease, pathological organisms may be present. Warmth: Decomposition is significant at approx. 50°F and proceeds most rapidly between 70° and 100°F. Between 100° and 212°F, the process slows as the reproduction of bacteria is retarded by the increased temperature and moisture is evaporated. Air: Oxygen-consuming organism activity is retarded by the absence of air. Restriction of airflow around remains will slow the decomposition process. Moisture: Microorganisms require moisture to function. A body normally contains enough moisture for the bacteria to multiply. Decomposition odor will tend to form a scent pool above and around the remains. Air flow will move the scent away from the source in the direction of the wind, forming an air scent cone. Water will move the scent away from the source along scent conduits in response to gravity or currents, along surface of underground waterways; or following erosion or drainage patterns. Wind or water flow can be altered by scent barriers. Water flow along a conduit can interrupt the absorption of scent into the soil near the remains causing a scent void near the remains at the dog-nose level. Variable wind patterns can cause an uneven distribution of scent molecules in the air. Elevation of the body with a horizontal scent cone can produce a scent void near the remains at dog-nose level. Understanding the natural processes that influence outdoor death scenes is vital to the success of conducting and interpreting searches. The study of what archaeologists and paleontologists calls “death assemblages” is termed taphonomy, which literally means the laws of burial, but can refer also to unburied bodies exposed on the earth’s surface. In other words, taphonomy includes knowledge about the process by which a body is transformed from a living being to dust—or fossils, chemical constituents, or mummified remains. In forensic taphonomy, we are concerned with the earliest part of that postmortem period. When conducting a search, a dog/handler team is, in effect, searching for evidence. Most of the legal cases regarding dog searches deal with drug seizures, but the principle under which the issues are raised apply equally to cadaver dog searches. The two primary areas of concern are the acquisition of evidence and the acceptance of that evidence by a court. Unless the search team is operating within the guidelines set down by the Constitution and the court system, any evidence located during the search may not be admissible at a trial. • The Fourth Amendment of search and seizure is the applicable standard. No warrant will issue without probable cause. What constitutes a search with a dog? The court decided in United States v. Place, that the activity of a drug-sniffing dog was unique. The dog only alerted if there was evidence of contraband. Therefore, the dog was only disclosing criminal behavior and a warrant was not necessary. No intrusion of an innocent person’s privacy would occur. Many courts have allowed searches by air-scent dogs without a warrant when the search has been based on other facts that gave the police a reasonable suspicion. Courts, however, will not allow dogs to be used for general exploratory or dragnet-type searches. The decisions in these cases appear to be very fact specific. The court’s decision to allow lesser evidence or exigent circumstances to be substituted for the need to obtain a warrant remains unpredictable. The issues above rarely occur in the context of cadaver dog searches. These searches are usua lly the result of prior investigation. Cadaver searches by their very nature will lack exigent circumstances except in the rarest of cases. Those cases will usually involve the suspicion that a vehicle either has a body in it or was used to transport a body. The principle area of concern for cadaver dog handlers is the possibility of warrantless entry onto property where there is a justified expectation of privacy. Open fields are not protected by the Fourth Amendment. The surrounding area or curtilage—areas adjacent to structures—requires a warrant. With public land there are no privacy issues involved. 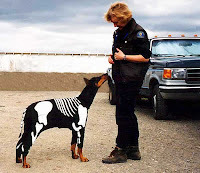 There you have it: the working cadaver dog.